Hard as steel: that’s the best characteristic of MANOWAR’s bassist and the band’s founding member. Riding the ‘true metal’ stallion for almost 35 years, Joey DeMaio exerts a no-frills approach not only on-stage and on-record but also in conversation. Here and now: that’s the principle he’s not willing to bend, and when he faces a question that concerns the ensemble’s past – as opposed to current affairs concerning the “Kings Of Metal MMXIV” album – DeMaio’s interest wanes. The more focused an interview becomes, then, and more palatable for those who don’t belong to the MANOWAR fandom. – Joey, is “Kings Of Metal MMXIV” a statement of the band’s relevance or what? It is a statement of our loyalty to our fans and wanting to provide them with the updates versions of songs that they’ve loved for so long. – And what’s the point of updating the songs? Sure, they were recorded with a limited, if compared to modern, equipment, but anyway? And why this album? Well, it’s the twenty-fifth anniversary of the release of the record, and it’s the record people all over the world love, and we love it, too. We played the songs over the last 25 years which have matured and changed, and we wanted to also give the current band members the chance to record the songs that they love so much. Oh, thank you. But I haven’t heard anybody say it’s sacrilege; I’ve heard all the people say they really love it. And we’re very proud of it. As for the lyrics, on the first version we played we used lyrics that mentioned countries that we had played, but it’s been 25 years, and in 25 years we played more countries and, of course, we want to respect all of our fans. We don’t care about other kinds of bands and other kinds of metal. We only care about our fans and bringing our music to the world. And it’s true, we want everybody to respect everyone. – So how do you feel about your contribution to the “Hell Comes To Your House” compilation with “Blood Of My Enemies” in 1984? We feel that our music unites people and brings out the wish for everyone to be positive and to enjoy brotherhood all over the world. – How many people in your opinion are aware of the fact that MANOWAR aren’t just a sophisticated metal band but a pure rock ‘n’ roll unit? They will see it when we come to play and perform. People who have brains and think and care understand that – they understand our music. – And how do you balance your mythological concepts with a good-time rock ‘n’ rolling? We believe that everybody has to have fun, to work hard, to play hard, and everybody has the right to just enjoy themselves. That’s what the gist of true metal is. – Did you feel the same when you roadied for BLACK SABBATH? Absolutely! I just loved working with BLACK SABBATH, I loved Ronnie James Dio, who was a dear friend of mine, and the rest of the guys in the band. And I’d always thought of music that respected and honored our fans. – What lesson did you bring out from working with SABBATH? Oh, a lot of lessons. I loved the way that they cared for their music, I loved the way that they believed in their music, I love the way that they still perform their music today, and they really enjoy and love what they do. They give their fans what they have, which is love for music and respect. – I knew Ronnie, too, and I saw his attitude towards his fans. How important is this interpersonal aspect of your band’s work? – How intelligent your regular fan should be to dig all those concepts you put in your lyrics? I think our fans are very, very intelligent people. I think they respect each other; you’ll see it once you see MANOWAR live. – Power metal that you originated: aren’t these bands too serious? I don’t care what other bands do. I have no opinion. Not interested. – But you manage RHAPSODY OF FIRE, so you do care about younger musicians! Of course, if I am working with somebody and they’re on our record label, I have to care about them! That’s part of the responsibility. – What possibilities does having your own record company give you? I think it’s given me the chance to appreciate the music of people that are struggling and have strong will and the wish to create something special and be different. – And what’s different about your new world tour? 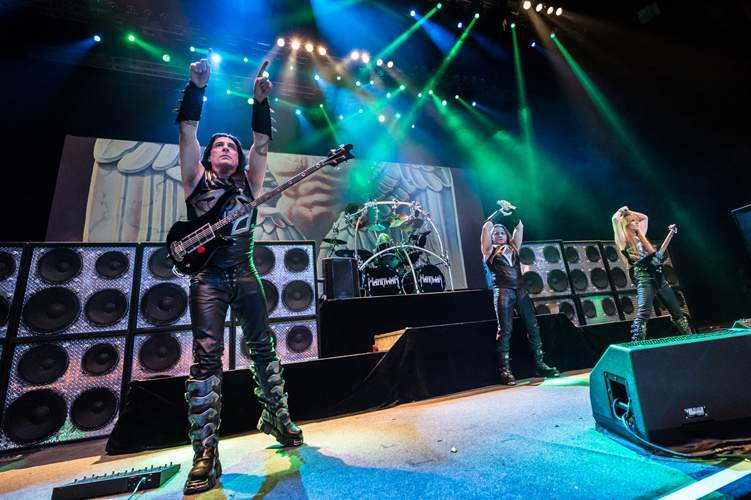 It’s going to be a celebration of the “Kings Of Metal MMXIV” album, and the concert is based around that – it’s a very exciting, energetic show that’s going to be completely full of power and really, really blow the roof of the building.